GULFPORT—While most student volunteers who come to the Mississippi Coast during their Spring Break equip themselves with paint brushes or construction tools and head to work sites, culinary students from Mercy Vocational High School (MVHS), Philadelphia, PA, were here in April with a different purpose in mind—sharing recipes and cooking tips with local children. 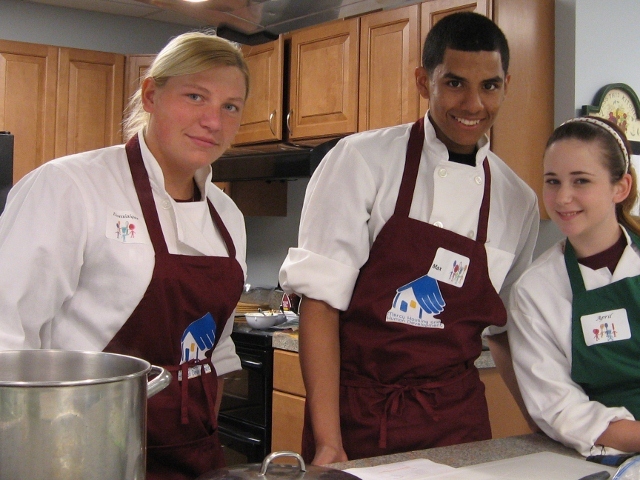 Mercy Housing and Human Development hosted a Kids in the Kitchen program for local youngsters during MVHS’s spring visit, with a hands-on cooking demonstration at Mercy Housing’s teaching kitchen. Three MVHS culinary students demonstrated their cooking skills with cheeseburger chowder, a pecan salad, spring rolls, fruit smoothies and a pineapple sponge cake, all from simple recipes they shared with the local children. Other students with the Operation Katrina group shared their construction skills and office practice training, working on a variety of projects in Biloxi and Gulfport. The Pennsylvania school is the only Catholic vocational high school in the U.S. This is the sixth year since Hurricane Katrina that student groups and instructors from MVHS have donated their spring vacations to help storm-impacted families and non-profit agencies that serve the Mississippi Coast community.